A small and unassuming looking herb, anise (also called aniseed) has been treasured by many different civilizations since antiquity. While it is related to several other well-known herbs such as cumin, fennel and dill, anise has made a special place for itself. 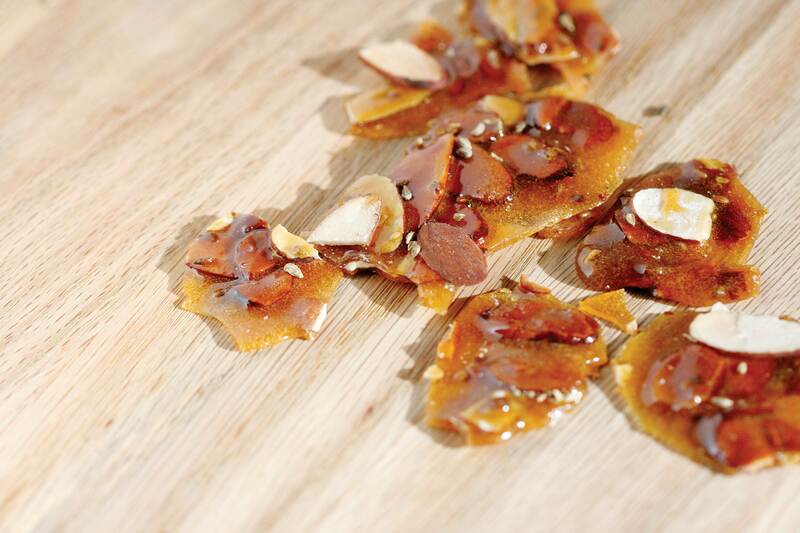 Today we’re bringing you a recipe for Anise Almond Brittle, a perfect treat to start the fall season. First, let’s find out why this little spice has been popular for millennia! Native to Egypt, Greece, Crete and Asia Minor, anise has been a mainstay in many ancient societies. It is a delicate, white flowering annual that can grow to over 3 feet tall and shares flavor similarities with other spices such as star anise, fennel and licorice. The Egyptians used anise for many different purposes, including cooking, medicine, mummification and even in practices of magic. It was first mentioned in the Ebers Papyrus, a compilation of Egyptian medical texts from around 1550 CE. It was used as a diuretic, to treat digestive ailments and to help with the pain of toothaches. The ancient Greeks used anise medicinally to a great extent. The Greek physician Dioscorides (born 50 CE) described the many uses for the herb in his treatise De material medica. He liked to use it for digestive issues, headaches, insomnia and even as an aphrodisiac. Hippocrates recommended it be taken for cases of respiratory distress such as excessive sneezing and coughing because it would clear the mucus from the passages. 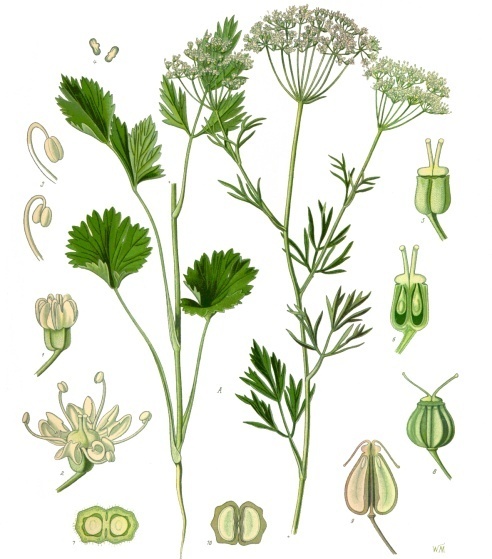 Anise was also used in cooking both sweet and savory dishes. It was the main ingredient in a medicinal wine called annesaton, which was a precursor to the famous Greek ouzo. Ouzo is an aperitif flavored with anise and said to possess medicinal properties. It has been an integral part of Greek cuisine for centuries. Rome, of course, borrowed many of Greece’s ideas about medicine and continued on in the tradition of using anise for its curative properties. Pliny the Elder, a contemporary of Dioscorides, also wrote extensively about the uses of anise. He repeated many of Dioscorides’ indications including using it as an expectorant and as a cure for gas and bloating in the intestines. He added that Pythagoras particularly appreciated anise and used it both raw and cooked. The Romans frequently used anise as a spice for their food. Specifically, they used it in a cake called a mustacae, which was a cake spiced with anise, cumin and other aromatics and served at the end of a meal to prevent indigestion. The Roman military carried anise throughout the empire. It became popular all over the world, eventually making its way to the Americas and beyond. Today it is used in a plethora of dishes all over the globe. It spices meats and soups, adds its unique flavor to sweets and desserts and contributes its inimitable medicinal properties to aperitifs and liqueurs. An even more popular use is in cough medicines and lozenges. While its benefits as an expectorant have been proven, its flavor is even more cherished in these medicines. Enjoy this delicious and original recipe for Anise Almond Brittle, but don’t let this be the end of your exploration of anise. There are so many interesting ways to celebrate this ancient little herb. Click here to find a multitude of recipes to try. *Recipe courtesy of MotherEarthLiving and Sarah Goldschmidt. In a 250-degree oven, toast almonds on an unlined baking sheet until golden and fragrant. Set aside. In a medium pot, combine sugar, water and cream of tartar. Stir over medium heat until sugar is dissolved. Cover the pot and let boil approximately 5 minutes undisturbed. Remove lid and examine color of the molten sugar. When the mixture turns amber, quickly add almonds and aniseseeds, gently stirring to incorporate. Pour the brittle onto a Silpat or buttered cookie sheet. Spread candy thin with a buttered spatula to achieve glass-like texture. Gaifyllia, N. (n.d.). Anise. Retrieved September 15, 2014. The Editors of Encyclopædia Britannica. (n.d.). Ebers papyrus (Egyptian texts). Retrieved September 15, 2014. Jodral, M. (2004). Illicium, pimpinella, and foeniculum. Boca Raton, FL: CRC Press. Kowalchik, C., & Hylton, W. (1987). Rodale’s illustrated encyclopedia of herbs. Emmaus, Pa.: Rodale Press. Dalby, A. (2003). Food in the ancient world, from A to Z. London: Routledge. Grieve, M. (n.d.). Anise. Retrieved September 15, 2014. This entry was posted in Blog, Bon Appetit Wednesday, Culinary, Culture, Healing Arts, Science and Technology and tagged ancient cuisine, Ancient Egypt, ancient food, Ancient Greece, ancient history, ancient recipes, Ancient Rome, anise, aniseed, AntiquityNOW. Bookmark the permalink.